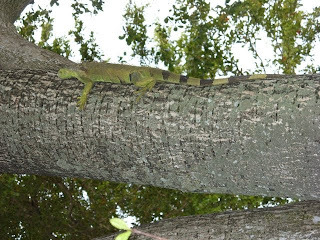 Iguana on a tree? Yes, in South Florida we have Iguanas running hot and cold all over the place. In fact anywhere south of the I-4 line you can see them, especially near water and vegetation. In winter we have "Iguana Season". That's meant cynically because in Cold Weather (under 50F/10C) their muscles get less efficient, they slow down and they fall from the sky. Like apples (or oranges) in a grove, these prehistoric looking things simply drop out of the trees. Believe me, finding a 6 foot long (nose to tail tip) Dragon of an Iguana looking stoned on the Pool Deck was a bit of a shock to me. I picked that particular one up and dropped him in the trash bin and when he thawed out he came back alive and quite unhappy! Now that I know what they do to my Bouganvillea, Hibiscus, and Gardenia, I wish he hadn't survived. They do not share, and will denude your plants. Since there are no natural predators, you're sunk if you don't plant things they dislike. If they shared I wouldn't mind but literally they strip things down to sticks!